Die zweite Auflage der deutschen Ausgabe ist erschienen. Sie kann beispielsweise auf Amazon.de oder direkt beim Verlag bestellt werden. Wir waren sehr erfreut, als uns der Verlag mitteilte, dass die erste Auflage dieses Buches bald vergriffen sei, und uns nach einer zweiten Auflage fragte. Am liebsten würden wir das halbe Buch neu schreiben — nicht etwa, weil der Inhalt schlecht ist, sondern vielmehr weil man heute viele Dinge noch besser erklären könnte. Leider ist der Zeitplan für eine zweite Auflage deutlich enger gesteckt, als dies bei einer Erstauflage der Fall ist. Allein deshalb ist es vielen Fallstudienautoren nicht möglich, ihre Fallstudien zu überarbeiten oder gar neu zu verfassen, um beispielsweise geänderten Rahmenbedingungen oder neuen Softwareversionen Rechnung zu tragen. Hinzu kommt, dass viele unserer Kontributoren heute in neuen Firmen oder Projekten arbeiten. Damals waren wir uns noch nicht bewusst, dass wir mit diesem Satz ein Grundproblem der Softwareentwicklung angesprochen haben. Zu wenig „gegenseitiges Verständnis“ ist eine Folge von Kommunikationsproblemen, die nach unserer Erfahrung durch den Einsatz von noch mehr Softwarewerkzeugen nicht gelöst werden können. Gelingt es den Entwicklern nicht, dem eigenen Management oder dem Kunden den Wert von Qualitätssicherung zu vermitteln, so stimmt das Rollenbild, das die beteiligten Parteien vom Entwicklungsteam haben, vermutlich nicht überein. Daher werden wir das Buch um ein Kapitel von Judith Andresen ergänzen, das Ansätze dafür liefert, wie Entwickler einem internen oder externen Kunden den Wert von Qualitätssicherung vermitteln können. Wir, damit sind Sebastian Bergmann und Stefan Priebsch gemeint, werden die von uns verfassten Kapitel überarbeiten und erweitern. So werden wir beispielsweise das Refaktorierungsmuster „Kapitel extrahieren“ auf das Kapitel „Testen von Software“ anwenden, um das Testen von Legacy-Code in einem eigenen Kapitel zu behandeln. Ein Abschnitt zum Thema Integrationstests kommt ebenfalls neu hinzu. The English Edition of the PHP Quality Assurance book started shipping. Sebastian and Stefan as well as their contributing authors, are very happy about this. Almost a year has passed since we finished the manuscript for the German edition of the book — and almost half a year since the German edition started shipping. High time for another status update. The video below shows a visualization of activity in the book's Git repository since April 2010. During this timeframe we mostly worked on translating chapters from English to German and editing the chapters for the German edition followed by translating chapters from German to English and editing the English edition's chapters. 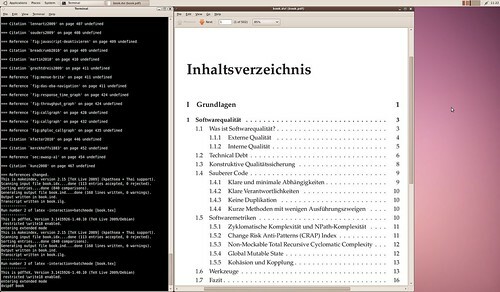 As you can see from the video, the work on the English edition is now complete and the Git repository is quiet. The English edition is scheduled to ship on May 10, 2011 under the title "Real-World Solutions for Developing High-Quality PHP Frameworks and Applications". The German Edition of the PHP Quality Assurance book started shipping. Sebastian and Stefan as well as their contributing authors, are very happy about this. We are almost done with the manuscript for the German Edition of the book. In a couple of days we can focus on getting the manuscript for the English Edition ready for the publisher. As we only have a deadline for the German edition so far and since we received the majority of contributed chapters in English, we are currently busy translating the contributed chapters from English to German in an effort to meet their deadline. We are currently looking at a release date for the German edition in late spring / early summer of 2010. Once we have finished the manuscript for the German edition, we will start working on the manuscript for the English edition. Hopefully, this process will be much faster as we only need to translate a couple of chapters from German to English. We are hopeful that the English edition will be available not much later than the German edition. We, Sebastian Bergmann and Stefan Priebsch, are writing a book on "Quality Assurance in PHP Projects". The book will be published in English and German at the same time later this year. The idea for the book is that we write the introductory as well as the concluding chapters while other authors contribute case studies for the middle part of the book. The case study authors will not always agree with each other. In fact, we invite different opinions on how problems are solved to give the readers not "one single truth" but provide different approaches to problems and views on issues. Our motivation to write this book is simple: there is no such book on the market and from our experience a book such as this is needed. We get questions from our clients all the time: which book can I get for my developers or recommend to potential job applicants as required reading for the topic of web application quality assurance? This book will be the answer to these questions. The list of case study authors includes contributors to well-known Open Source projects from the PHP community as well as developers working on some of the largest websites built using PHP, which happen to be some of the Web's most popular sites. Other contributing authors write about practices and tools. Over the course of the next weeks, we will introduce each case study author together with the case study he or she is contributing to the book.